Kids keep roaming onto my properties in Atlanta searching for fictitious creatures. What Is Pokémon Go? This is an all too familiar issue that property managers face today. Children roam the streets (and sometimes your properties) in search of elusive Pokémon. However, many property managers wonder: What is Pokémon Go? How does it work? We’ve put together the ins and outs of Pokémon Go to help you understand the odd behavior and language of many children (and some adults). Pokémon Go is a game that you can download on smartphone. The games uses wireless network access coupled with GPS and your camera to bring your neighborhood alive for Pokémon enthusiasts. The game screen is actually a cartoon version GPS map of your neighborhood and you can walk to different locations to engagedifferent aspects of the game. Players are encouraged to get outside, ‘catch’ Pokémon, stop at different locations for supplies, and battle other players at local Gyms. Pokémon are fictitious creatures that roam in the wild. There are 135 different Pokémon that you can acquire in Pokémon Go. They are sorted into different categories or types and can be stored in a ‘Pokédex’ where each is assigned a number for you to track them. How do you catch Pokémon? First you must find Pokémon. You can use incense in the game to bring them to you, but most of the time you have to get outside and search for them. When one is near, your phone will vibrate and the Pokémon will appear on your cartoon-like map. 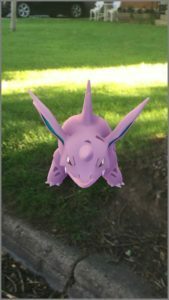 Click on the Pokémon and your phone’s camera will activate, showing the Pokémon appearing in your actual surroundings. There are certain supplies that make playing the game easier and more rewarding. While you can make in-app purchases of these items, they can also be acquired free at local PokéStops, which are oftentimes churches, art pieces, historical markers, and other significant landmarks. You must physically go to a PokéStop to collect supplies. 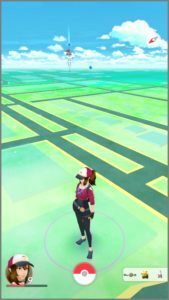 Just like PokéStops, Gyms will show up on your map in the game. 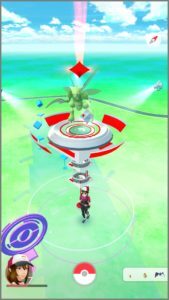 There are three Pokémon at each Gym that you must defeat in order to claim that Gym for your team. Initially you will be on your own and only be able to catch low level Pokémon, but with experience, can climb levels and catch higher level Pokémon. Leveling up is achieved with experience points. The more you play, the higher you climb in levels. You can earn experience points by catching Pokémon, hatching eggs, visiting PokéStops, and battling at a Gym. You have to reach a Level 4 before you can choose a team to join. Once you reach level 4, you can go to a Gym where you will be given the chance to join a team and battle other players. Only three teams exist: Yellow: Instinct, Blue: Mystic, and Red: Valor. You can only choose once to join a team. When you battle in Gyms later, you represent your team and the Gym will be the color of the team that has claimed it. Kids searching for #Pokémon aren’t prone to cause property damage.